​Shanghai’s official micro-blog, launched by the municipal government’s news office about hot issues such as the new scientific and technological innovation coupon and preferential policies for science companies. 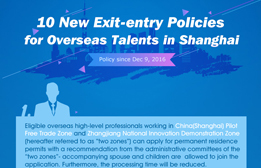 The Shanghai Municipal Government issued a guideline to attract overseas Chinese students to return and work or startup businesses in the city on Feb 1, with benefits and favorable policies. ​Overseas professionals in Shanghai, who have been introduced by the Thousand Talents Plan, a national program to bring in top global talents to the Chinese mainland. More than 1,300 start-up projects in Shanghai have obtained 260 million yuan ($39 million) in government-guaranteed loans during the first half of 2016, Pudong Times reported on Aug 16. ​Shanghai launched a youth entrepreneurship initiative on July 27 to cultivate about 200 young entrepreneurs to meet the demands of Shanghai's development, Pudong Times reported.